Learning through laboratory and clinical components. Hands-on experience during the first year. Opportunities to work with real patients in area medical centers. Annual cohort of 30 students. Satisfying Monmouth’s admission criteria for the University and for the BSN program. Writing an essay that expresses an interest in, and commitment to, the nursing profession. Demonstrating a strong background in the sciences. Exposure to a healthcare setting or related experience is encouraged. Maintaining a cumulative GPA of 2.75 or better. Achieving a minimum standard grade of C+ in prerequisite courses (CE 109, BY 111, BY 107, BY 112, HE 200). Maintaining a standard grade of C+ in nursing clinical didactic courses (NU 201, NU 202, NU 203, NU 204). With the rising healthcare needs of today’s society, there is currently a high demand for qualified registered nurses. 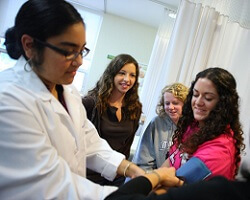 To meet this demand and educate the nurses of tomorrow, Monmouth University is offering a pre-licensure Bachelor of Science in Nursing (BSN) program for students committed to a career in nursing. For professional nurses interested in career development, Monmouth also offers RN to BSN programs designed around the schedules of working registered nurses. Nurses who hold a bachelor’s degree are increasingly recognized as qualified generalists who advance in their field and are eager to realize their full potential. Through this program, students receive the necessary preparation for RN licensure, as well as a valuable, wide-ranging liberal arts education that will keep them ahead of the curve. This BSN program includes both laboratory and clinical components, enabling students to work with real patients in area medical centers. Students begin hands-on clinical experience in the second semester of their first year. Enrollment in the program is limited to a freshman-only cohort of 30, which allows each student to receive the personalized attention and opportunities typical of a Monmouth University education. Our program enables students to earn their degree and prepare for RN licensure in a dynamic learning environment. Students are supported to achieve personal and intellectual growth through one-on-one mentoring and guidance toward clinical proficiency. Our highly experienced faculty understand that nursing is not only a science backed by research; it is an art that reflects the performance of skilled tasks and human interaction. With this continuing support, close collaboration, and commitment to the values of nursing, students are able to gain confidence in their ability to enhance wellness for all in their care. After receiving their BSN, our graduates can continue in one of our MSN programs. With our graduate nursing programs recognized by national publications such as U.S. news & World Report, Monmouth is establishing itself among the best nursing programs in New Jersey. Professional nursing is an art and a science that encompasses the breadth of human health and welfare. At Monmouth University, we believe that an ability to educate our students at the baccalaureate level leads to committed professionalism. Please join us to become a professional nurse in a dynamic learning environment and be fully prepared to apply research-based practice in today’s evolving healthcare environment.